More of the same as far as the rockcod fishing goes. We nailed the schooling fish again in no time flat. Several yellowtails, olives and bluefish went home with our fishers today. With 7 passengers on board there was a ton of elbow room and no tangles to be had. As per our usual, after the fishing it was time to go pull crab pots. I wasn’t looking forward to pulling our crab gear because we’ve had some slow days as far as crabs go. After 20 minutes of running up the coast we got to our first pot which had 4 crabs in it which is okay. Pot number 2 had zero…. pot 3 had zero…. It was looking like a long slow day of not too many crabs. All of our gear was spread out across the bay and when we got to our second string of pots our luck began to change. Several pots were coming up with 5 or 6 crabs all of the sudden, one pot even had 13. 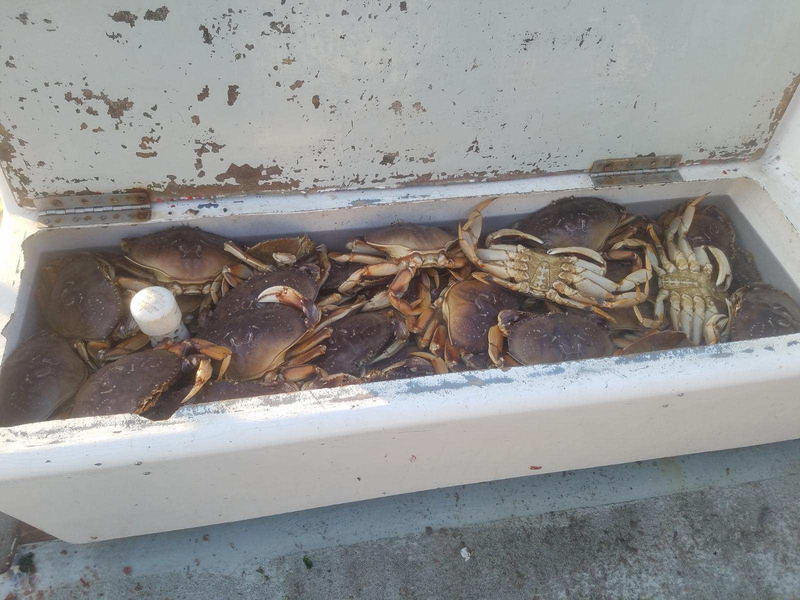 We ended the day with 71 crabs for 7 passengers!